What is the Rafael Hydraulic 500 Lift? 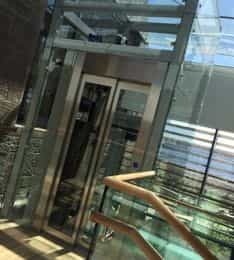 Whether it’s for indoor or outdoor use, a domestic or commercial environment, the Rafael Hydraulic 500 lift is a stylish and practical option that can provide access up to 12 metres at the push of a button. Like all hydraulic lifts, the Rafael Hydraulic 500 exploits Pascal’s principle; air compressors pressurise hydraulic oil and fluids to move pistons which in turn enable the cabin to be moved up or down, carrying loads of up to 500kg. One of the things that sets this lift apart are the fully customisable options, which enable it to become either a stylish feature or a subtle addition to your building, or indeed anything in between. With a range of sizes available to suit your requirements, this lift can accommodate up to six passengers at one time and transport them at 15 metres per second, so why not make the interior of the cabin as appealing as possible? The standard options offer a variety of skinplates, or interior wall panels, with colours available in neutral tones and finishes, including laminate-effect and marbled for a professional, formal look. If a brighter palette is more in keeping with your style, we have a wide range of additional colours to create a cheery lift interior. With lift-etiquette being what it is, there’s a good chance the floor will become a focus-point so the variety of choices available, from the linoleum-effect adding a clean look in five shades as a standard option to the laminate and granite-styles that can be included as extras, make this Rafael lift a versatile solution. The mirrored wall, coupled with energy-saving LED spotlights, makes for a bright interior that will show off your choice in cabin wall décor as your passengers make the journey from floor to floor. The brightly-lit in-car display not only clearly shows users which floor in the building they are currently on but is also easy to use, making navigation around your premises simple and straightforward. As we make it our business to support the provision of access to all, we provide a number of standard furnishing options for the interior of the lift cabin, including handrail, tactile and braille buttons with an LED halo. This ensures that your property is not only accessible for visitors or customers, but also allows them to travel safely and securely. Direction of travel and floor selections can be made via a voice synthesiser so that your lift truly is a viable option to enable people to get from floor to floor as easily as possible. The low headroom height and the comparatively low pit requirements – 200mm as standard or as low as 120mm possible upon request – make the Rafael a super-easy vertical platform lift to integrate into your existing premises without the necessity for costly or damaging construction work. Additionally, the electronically-controlled lock system enables safe access to the pit for maintenance and, should there be a power cut, the emergency lowering and lighting features facilitate a secure journey for passengers back to the lift’s starting position, so claustrophobes need not panic in the event of an outage. One of the many advantages this model of lift presents is the fact that you can choose the style that best reflects your business, and we have a suite of doors to add the finishing touch. Available as automatic sliding, swing or glass options, discreet doors allow your lift to blend seamlessly with its surroundings, whilst the more decorative equivalents make your lift an easily-identifiable feature for would-be users. This is particularly handy if your intended passengers are potential customers, as your lift – and by default, access to your products or services – represents part of their experience with you. This platform lift shares many of the features of our Leonardo model but has the additional advantage of greater load capacity. At 500kg, the Rafael is incredibly robust and can accommodate up to six persons safely. Clearly the lift is not only effective for moving people from one floor to another; it can also be a vital resource for transporting heavy products or other items in a safe and efficient manner. Remarkably, the heavy load capacity would enable two adult alligators, a full-size telephone pole, a fully-grown thoroughbred racehorse or equally a Caparo T1 Supercar to travel up to 12 metres in this lift should you need to do so. Complying with Part M of Building Regulations, the DDA and conforming to the Machinery Directive 2006/42/EC, the Rafael Hydraulic 500 Lift is a perfect option for a public space. It is also easy to integrate into a domestic property, so if you’d like to see more details you can view our brochure and our experts are on hand to help you with every stage of your platform lift journey.